Built to Last: A unit is only as good as the parts inside it. That's why we construct this model with galvanized steel coated in a corrosion-resistant, polyester-urethane finish. Quiet: Swept-wing fan blade reduces unwanted noise. Premium Aluminum Coils: This model of air conditioner contains all-aluminum Micro-Channel coils for increased corrosion resistance and a reduction in coil leaks. 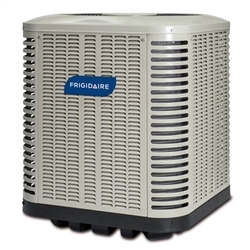 Save Money on Cooling: This particular air conditioner model (in certain sizes and matches) meets ENERGY STAR's requirements for its high-efficiency designation. Achieve Best Efficiency: In order to achieve the greatest efficiency possible, pair this air conditioner with an air handler or gas furnace with an energy-efficient motor. Checked Numerous Times: With thorough quality checks, you can expect a quality unit. This air conditioner is checked 144 times for assurance. Exceptional performance comes standard with the FSA1BE series of air conditioners. If you pair this model with select air handlers or quality engineered coils, this unit can achieve high-efficiency up to 15-SEER cooling – when you pair this model with an air handler or gas furnace that includes an energy-efficient motor.